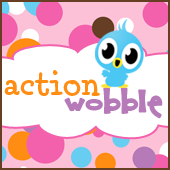 Action Wobbles: Action Wobble - Got Catnip? I'm Heidi from Smiley Guy Designs and I’m here with today’s inspiration post. I've use a cute stamp and matching die set from Stampendous. Here is a close up of what the action wobble looks like when attached to the card. It's never easy to get a picture of the wobble in action but here's my attempt...makes me laugh - the googly eyes make the cat look a little drunk.